At the first of a planned annual Salmon Summit, a big statement was made against Atlantic salmon net-pen farming in the Salish Sea. 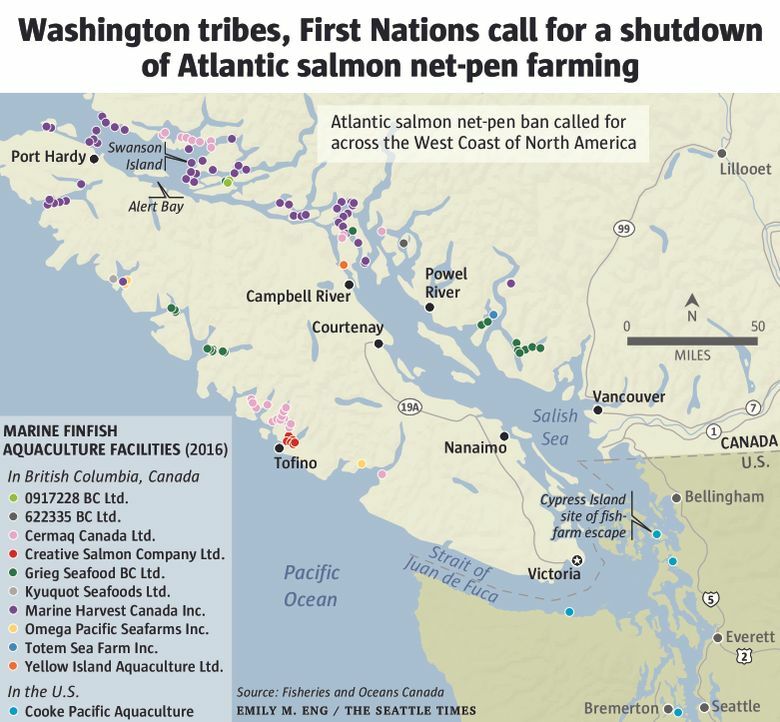 TULALIP, Snohomish County — Washington tribes on Monday joined with First Nations peoples in Canada in a declaration calling for a shutdown of Atlantic salmon net-pen farming along the West Coast of North America. The declaration was endorsed at the first of a planned annual Salmon Summit convened at Tulalip to bring together tribes, First Nations, government agencies, and conservationists to preserve Pacific salmon in the cross-boundary waters of the Salish Sea. “We congratulate you for the strong stand you have taken against this industry,” said Ernest Alfred, a traditional leader of the Namgis First Nation, which is seeking a shutdown of 20 Atlantic salmon net-pen fish farms in British Columbia, with leases that come up for renewal in June. Just as in Washington, First Nations opponents of the farms want those leases to be terminated, rather than renewed. Alfred and other fish-farm opponents have occupied a fish farm at Swanson Island in the Broughton Archipelago to show their opposition to Atlantic salmon net-pen fish farming in British Columbia ever since a net-pen breach at Cooke Aquaculture’s fish farm at Cypress Island in August 2017 released more than 250,000 Atlantic salmon into Puget Sound. Three Washington state agencies blamed Cooke’s negligence for the breach, which sparked outrage and was a catalyst to the call to end Atlantic salmon net-pen farming in Washington waters. The Washington Legislature has moved to phase out Atlantic salmon fish farming in open net pens in Washington waters by 2025. The governor has said he will sign the bill into law. Now, Alfred and other First Nation leaders are insisting the industry be shut down in their territorial waters and anywhere else it is operated without First Nations consent. “I represent many people all up and down the coast when I say we want the fish farms out,” Alfred said. Alfred took the stage at the summit and asked for a show of support for the declaration and was thronged by tribal leaders from both sides of the border, conservation groups, agency staff and other supporters. The declaration minced no words. “The Coast Salish ancestral homelands, Salish Sea and people continue to face detrimental damages to the environment and resources based on the pollution-based economy. The declaration called for “consistency of law to ban all open net-pen Atlantic salmon fish farms. Alfred said First Nations in the Broughton Archipelago, home to 20 fish farms in British Columbia, never consented to the fish farms in their traditional waters. Marine Harvest, operators of the fish farms, has repeatedly sought dialogue with local First Nation leaders since the occupation began, said Ian Roberts, the company’s director of public affairs. Jeremy Dunn, executive director for the B.C. Salmon Farmers Association, headquartered in Campbell River, B.C., said the industry in British Columbia produces about 10 times the weight of fish as it does in Washington state. Net-pen Atlantic salmon farms are a $1.5 billion-a-year industry in British Columbia that employs 6,600 people, he said. While Namgis and other First Nations peoples in the Broughton Archipelago oppose the 20 farms there, Dunn said fish farmers elsewhere operate with agreements with 20 First Nations. Those farms generate about three quarters of the Atlantic salmon raised in British Columbia, he said. “In most areas not only do we have the support of First Nations, but we work in partnership with them,” Dunn said. He said fish farmers keep hoping to reach agreement with the First Nations in the archipelago. Alfred, the Namgis chief, said the occupation at Swanson Island will continue. The Namgis have gone to court to block restocking the Swanson Island pens. “If there are fish there again, there will be war on the water,” Alfred said. Farmed Atlantic salmon are a threat to wild Pacific salmon and his people’s way of life, said Alfred. The issue means so much to him and others they intend to remain at the farm until the lease is terminated, Alfred said. He has walked away from his job as an elementary- school teacher to take his stand, occupying buildings just upland of the Swanson Island fish pens. To him, other aspects of revitalizing aboriginal culture and language now take a second seat to salmon preservation. The summit was sponsored by the Tulalip, Lummi, Puyallup, Squaxin Island, Snoqualmie and Nisqually Indian tribes and organized by Salmon Defense, a nonprofit salmon recovery group founded by the late Billy Frank Jr.